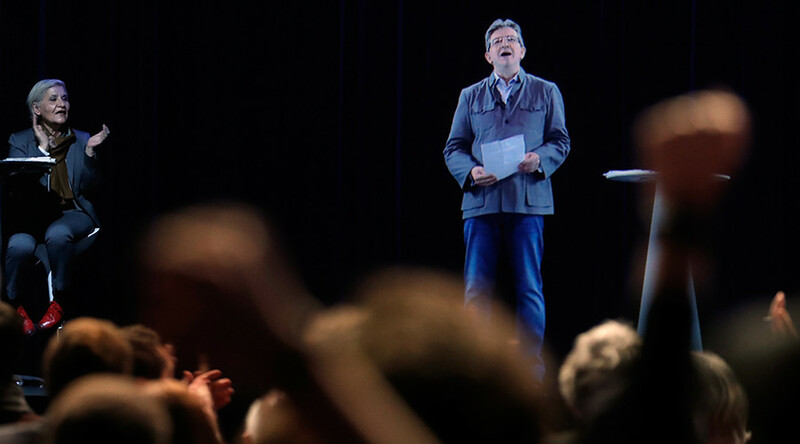 French leftist politician Jean-Luc Mélenchon used a hologram to appear at two presidential campaign rallies simultaneously in both Lyon and Paris. Mélenchon launched his technologically-advanced campaign Sunday by appearing at a rally in Lyon in person, and in the form of a 3D hologram at the same time some 500km away in Paris. The politician carefully timed his real-life appearance to coincide with his rival Marine Le Pen’s talk, also in the Rhône Valley city on Sunday at around the same time. The holographic image was in fact a live feed, albeit with a two-second delay, of Mélenchon transmitted by satellite and staged by the firm Adrénaline. It is estimated to have cost between €30,000 and €40,000, reports France24. Mélenchon isn’t the first politician to use the futuristic tactic to spread their message to the masses. Turkish President Recep Tayyip Erdogan used a huge hologram of himself to gain attention in 2014 when he was prime minister. Holograms have also been favored by fans nostalgic to bring back deceased entertainers Tupac and Michael Jackson.